TopRank Online Marketing is a B2B focused online marketing agency specializing in online customer acquisition and engagement. We help both consumer and business to business marketers connect with new and existing customers online through content marketing, search engine optimization, influencer marketing, social media marketing, community management, email marketing and online PR. Founded in 2001, we’re a boutique agency with a keen interest in what makes the social web work by a combination of experimentation, research and analytics. We’re a “Walk the Talk” social media marketing agency and bring unique and highly valuable insights from our own social participation (Blog, LinkedIn, Facebook, Twitter, Google+, YouTube) as well as the collective knowledge we’ve gained from numerous B2B and consumer focused consulting clients. TopRank Online Marketing agency serves B2B and B2C clients including Dell, LinkedIn, McKesson, Concur, Capella University, to several top consumer brands with a holistic web marketing approach to increasing sales and brand visibility online. As a pioneer in the fields of integrated Social SEO, Content Marketing and Online PR, TopRank’s team of creative, marketing, PR, technical and analytics specialists collectively produce results few other niche or even large agencies can match. 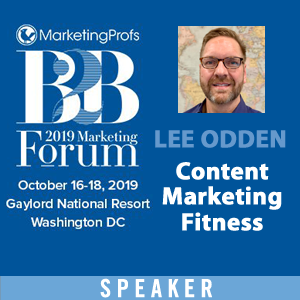 Dedicated to industry and social community involvement, TopRank’s CEO Lee Odden is a frequent speaker at industry conferences (Content Marketing World, PRSA International, Social Media Marketing World) world-wide from London to New York to Sydney. Odden also presents and provides training for corporate clients. We are also an annual sponsor the Social Media Breakfast of Minneapolis and St. Paul and we have sponsored the Minnesota Blogger Conference since its inception. With a main office in Spring Park, Minnesota on Lake Minnetonka (a Minneapolis, MN suburb), TopRank Online Marketing provides digital marketing strategy, consulting, training and implementation services in North America,Western Europe and Oceania. For more information about B2C or B2B digital marketing strategy and implementation services, contact TopRank toll free at 1 877 872 6628, info at toprankmarketing dot com or online.